The group trying to bring back Eastern Air Lines, the iconic Miami-based carrier that operated from the 1920s until 1991, has been filing paperwork, shopping for airplanes and dreaming about what crew members will wear in the aisles. In January, the Eastern Air Lines Group filed its initial application with the U.S. Department of Transportation and starting putting together operating manuals for submission to the Federation Aviation Administration. The company, which acquired the old Eastern name and logo in 2009, is now in discussions with major aircraft leasing companies for a fleet of new aircraft. “We expect to conclude arrangements in the next few weeks,” said Eastern’s president and CEO Edward Wegel. The airline plans to complete all regulatory requirements by the end of 2014, but the timeline for actually take-off, first as a charter operator and, later, with scheduled service, is up to the FAA and DOT. While it waits for approvals, Eastern has asked Miami Fashion Week organizers to invite top fashion designers from South Florida to create uniforms for the airline’s modern-day flight attendants. “The flight attendants will be recruited from the region and the company wants to capture, as much as possible, the look and feel of the Miami/Caribbean/Latin American landscape in the styling of the new uniforms,” read the official contest rules. Designers have been asked to submit sketches and mood boards for four outfits, plus a design for uniforms that might be worn in 2050. Winning designs will be announced during Miami Fashion Week, which runs May 15-18. “Previous Eastern Air Lines uniforms used a classic houndstooth print, which I love,” said designer Nikki Poulos , one of the invited contestants. She created a new houndstooth print as part of her entry. “Look closely at the print and you will see the Eastern Air Lines logo as the main graphic element,” said Poulos. She also created a tropical print using the airline’s signature colors of navy, turquoise and white – with an added splash of lime green – to capture the South Florida environment. Unfortunately, given the turbulent nature of the U.S. airline industry, it may be quite a while before the winning Eastern Air Lines uniform gets to fly. According to an unofficial compilation of airline bankruptcies put together by airline trade group Airlines for America, there have been 196 U.S. airline bankruptcies since 1979, with 49 of those bankruptcies taking place since January 1, 2001. This past March, for example, Florida Express Jet abruptly canceled planned service it had announced between several Sunshine State cities. PEOPLExpress, which like Eastern, is trying to create a new airline with an old name, “doesn’t seem to be making a great deal of progress,” said George Hamlin, president of Hamlin Transportation Consulting, “But there are a few notable exceptions, including JetBlue and Virgin America, which took many years to achieve a profit,” he said. Eastern still has name recognition and nostalgia for the ‘good old days’ of flying on its side. “It was one of the largest airlines in the world and retains good brand equity as it was the largest airline to fly to Latin America and the Caribbean and also operated the famous Eastern Shuttle between New York, Boston and Washington,” notes Eastern’s Wegel. Virgin America employees got swanky Banana Republic-designed uniforms last year. This past spring, Virgin Atlantic, All Nippon Airways and Qantas Airways unveiled fresh, designer-made duds for their teams as well. Now flight attendants, customer service agents and many of the more than 64,000 United Airlines employees worldwide have shed their old work outfits for a new wardrobe that “brings all of our employees together in a cohesive look and lets our customers know that we’re all on the same team,” said United spokesperson Charles Hobart. United’s new flight attendant uniforms, for example, are built around a core wardrobe of black trousers, skirts, sweaters, vests and blazers with two rows of silver braid on the sleeves. There are also two styles of dresses, including a blue dress with a black stripe detail. To come up with what United describes as its “more modern, sophisticated wardrobe,” the airline asked its employees to give on-line feedback, serve on uniform review teams, vote for their favorite designs and wear-test a variety of garments “They told us that comfort, functionality and durability were elements of a uniform that were important to them, as well as something that looked good,” said Hobart. “The overall look screams of function and comfort and not style. They seemed to have missed an opportunity to have made a more fashionable and current statement,” said Karen Giberson, president of New York-based Accessories Council. This was a treat: for msnbc.com’s Overhead Bin blog, I profiled Cliff Muskiet’s on-line museum of more than 1000 flight attendant uniforms. The address for his website — uniformfreak.com — says it all. Cliff Muskiet, an aviation-crazed kid who grew up to be a flight attendant for KLM Royal Dutch Airlines, has amassed a collection of more than 1,000 flight attendant uniforms. Muskiet got his first few uniforms in the 1970s and 80s. After a 1993 stop in Ghana, where he picked up some old Ghana Airways uniforms, he began collecting in earnest. Muskiet keeps his collection of uniforms and accessories in closets, containers, garment bags and suitcases in two rooms of his home in Amsterdam. For display in his online museum, he photographs each uniform on his one mannequin, which is a size 2. Among his favorites are two KLM uniforms that have sentimental value: a circa 1971 uniform that was the first one given to him and an example of the KLM uniforms worn from 1975 through 1982. “The uniforms remind me of my childhood and the many trips I made to the USA on KLM with my mother,” said Muskiet. Some of his other favorites are the uniforms worn by female flight attendants on Asiana Airlines in the 1990s, on Kuwait Airways and United Airlines from 1968-1971 and the current outfits worn by TAP Portugal and British Caledonian. Especially if you’re wearing the right, stylish uniform. It’s Museum Monday here at StuckatTheAirport.com and this week we’re taking another look at some of the photos and outfits in the Style in the Aisle exhibit at Seattle’s Museum of Flight. 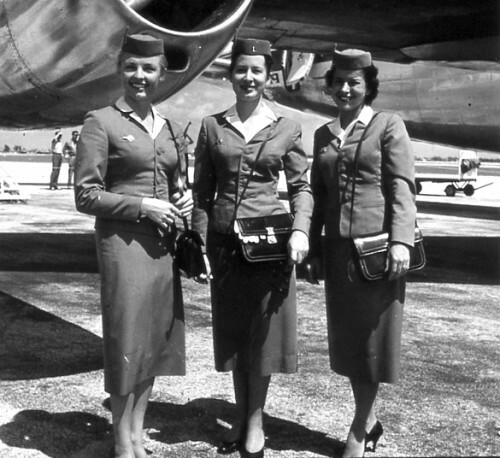 “Fashion designer, Oleg Cassini created a futuristic look for the flight attendants of Air West during the carrier’s brief existence prior to its purchase by Howard Hughes. The basic uniform consisted of a textured polyester dress and a jacket with an unconventional side-buttoning configuration. The pieces came in a selection of bright, solid colors inspired by the natural colors found at Air West’s destinations, including fern green, Pacific blue and canyon red.” Copyright Delta Airlines.